VES Inter School Sports Meet was held at Jawaharlal Nehru Stadium on 18th and 19th July 2018. In athletics, our students have won 29 Gold medals, 14 Silver medals and 11 Bronze medals. In games, our students have won totally 98 gold, 34 silver and 6 bronze medals. 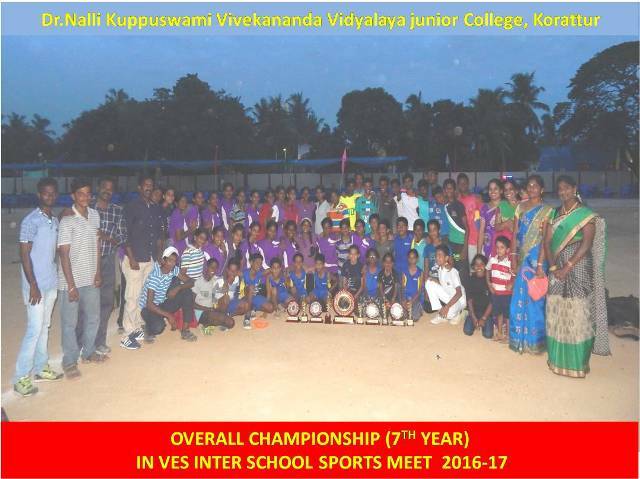 VES organized various games at various units from 16th June 2017 to 28th June 2017 VES Interschool Ball Badminton and Table Tennis was organized at our unit, VV Korattur on 17th June 2017 /Saturday. 157 students from VES units participated. 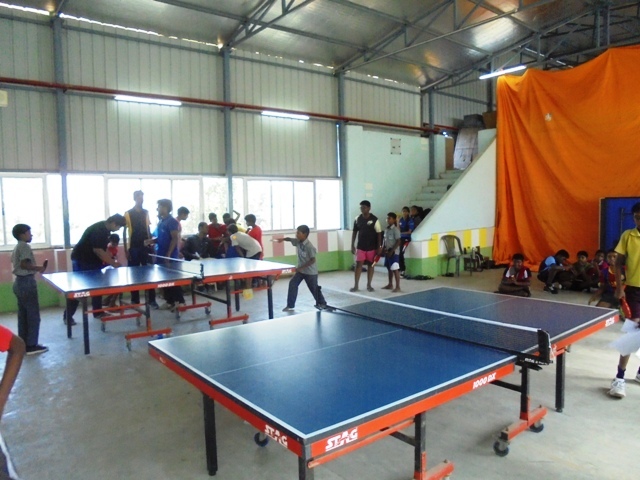 5 students among 6 categories have won prizes in Table Tennis from VV Korattur. Dr.M.Veerachamy, Joint director VIERT declared the tournament open during inaugural session. Prizes were distributed to the winners in the valedictory session by Dr.M.Veerachamy, Joint director VIERT, Smt.Prema Mahadevan and Smt.Sethubai Education Officers, VES. 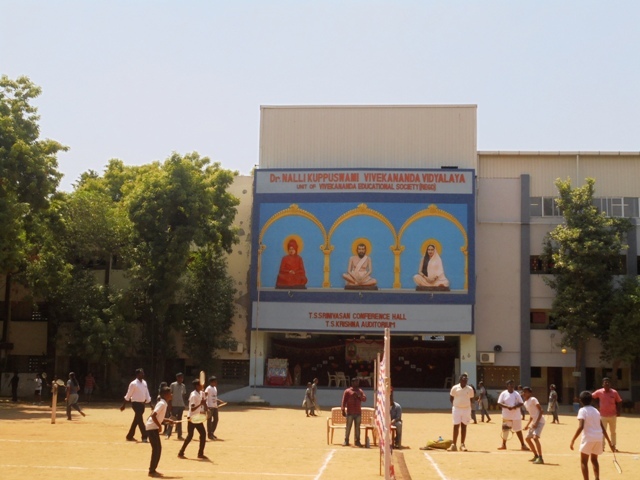 Students of Korattur have won prizes in Rope Mallakhambam, Mallakhambam, Silambam, Swimming, Skating,Table Tennis,Badminton, Carrom, Yogasana ,Kho-Kho and taekwondo. MANALI NEW TOWN V .V. In the VES Sports Inaugural Ceremony we had the privilege to perform a dance display by our High and Hr. Secondary students. Conduction of Brain and Brawn for child schools, First Aid and Ambulance department was assigned to us. We are glad that our students have won 36 Gold, 19 Silver and 10 Bronze medals in the VES Inter School Sports Meet. Out of 12 Champions 7 are from Dr.N.K.V.V., Korattur. Not only the students even the Teachers (Women) proved their might with the commendable victory in Tug of War. 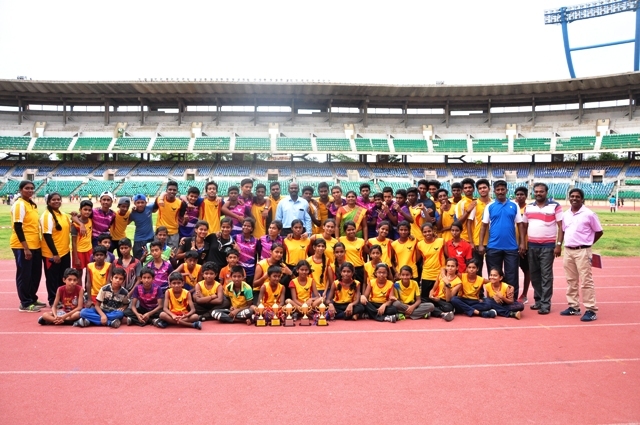 * Sports Development Authority of Tamil Nadu under the world beaters Talents Spotting Schemes conducted Regional level competition 2016 at SDAT Jawaharlal Nehru Stadium. S. Mithilesh Kumar of VIII D won first position in Long Jump (4.93 Mts.). He was awarded with Rs.6,000 as cash prize. 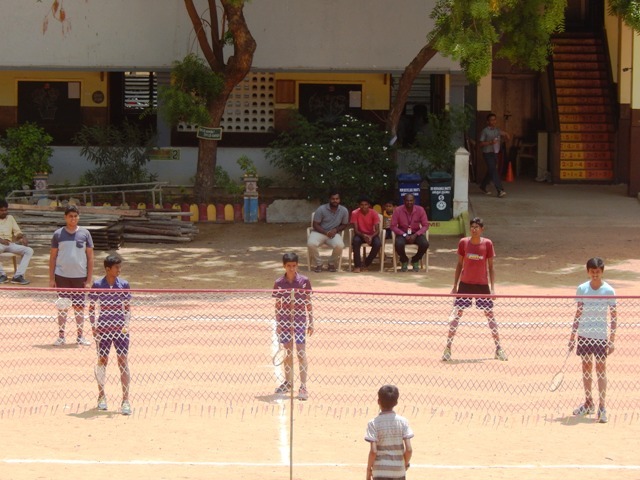 * VES Interschool Badminton and Table Tennis tournament was conducted in our school on 01.07.2016. Our Education Officer, Additional Correspondent Sri. P. Kesavanji were present for the inaugural function. In the valedictory function our Correspondent Sri. N.R. Narendranath, Additional Correspondent distributed the medals and certificates to the winners. In this tournament our Kishore boys are the winners. Tarun boys and girls have come out as runners. * VES Inter school Kho-kho tournament was held at Manali New Town unit on 04.07.2016. Tarun boys and Girls of our school came out as winners. Bala Girls and Kishore girls were the runners. * VES Interschool Taekwondo and Yogasana competitions were held at Mel Ayanambakkam and Mathur on 05.07.2016. 30 students in yoga and 15 students in Taekwondo participated. Our students bagged 8 Gold, 4 Silver and 1 Bronze medal. * VES Inter school Athletic Meet was held in our school on 18.07.2016. In this competition our children bagged 38 Gold Medals 15 Silver meals and 10 Bronze medals in various competitions. * VES interschool Swimming competition was conducted at Chitlapakkam unit on 19.07.2016. C.S. Rohit kumar of VIII-E bagged Silver medal. * VES interschool Skating competition was conducted at Chromepet unit on 20.07.2016. S. Varsha of II E participated in two events and has bagged Gold and Silver medal. P.S. Skrithik of VI E . S. Asisha of IV E have bagged two Gold medals. * VES Inter school sports meet was conducted at Manali New Town unit. Our school won the Overall Championship with 502 points. * On 03.08.2016, Taekwondo Association of Thiruvallur District organized Taekwondo Championship. The following students won the medals. * On 05.08.2016, 5th Open State Level Yogasana Championship 2016 was organized by Thiruvallur District Yogasana Association. M. Ramesh bagged III place in this competition. * Royal Knight Chess Academy conducted District Level Chess championship on 05.09.2016. In this competition, V. Yashwanthini of VIII D participated and bagged II place under 12 category. * 17th National Speed Skating Championship 2016 was held on 27th, 28th and 29th October. M. Varsha of VI E received the Individual Championship . I place in group event and II place in individual event.